By October 1976, Erol Büyükburç was one of the biggest names in Turkish music. He was a flamboyant showman, who looked like, dressed like and conducted himself like a star. Erol Büyükburç wore lame suits and was greeted by a legion of loyal fans every time he took the stage. These fans had followed Erol Büyükburç’s career since he made a breakthrough with his first hit single Little Lucy in 1961. It was the first of fifty-eight singles and two albums that Erol Büyükburç released between 1961 and October 1976. In, October 1976, there was another addition to Erol Büyükburç’s burgeoning discography, when he released his third album Hop Dedik, which was recently reissued by Pharaway Sounds. Unlike his two previous albums, Hop Dedik wasn’t an album of singles. Instead, Hop Dedik featured new material which showed a new side to Erol Büyükburç’s music. This was a new start for forty year old Erol Büyükburç. He was born on ‘22nd’ March 1936 in Adana, on the southern coast of Turkey. Growing up, music played an important part in family life. Erol Büyükburç’s mother played the violin, and his parents had an eclectic selection of 78s. This ranged from folk to pop and classical music. The young Erol Büyükburç was allowed, and encouraged, to listen to his parent’s collection to folk, pop and classical music. Soon, though, Erol Büyükburç wanted to learn to play a musical instrument. By then, Erol Büyükburç was attending a French language primary school. Most children at the school wanting to learn to play a musical instrument would’ve been sent to music lessons. Not Erol Büyükburç though; he sat and played along, copying his parent’s 78s. It seemed that he had a natural musician. Soon, though, disaster struck for Erol Büyükburç, when he had a brush with death. This happened when Erol Büyükburç and a sibling were playing in the family home. What happened next is lost in the mists of time. All that’s known is that Erol Büyükburç’s sibling pushed him out of a window. The fall nearly killed Erol Büyükburç, and he required twenty-two stitches. To recover from the accident, Erol Büyükburç was advised to rest at home. Erol Büyükburç used the time wisely, listening to music, which was fast becoming his favourite pastime. By 1951, Erol Büyükburç Büyükburç was about to start high school in Istanbul, where the family had moved a few years previously. The school specialised in economics and Erol Büyükburç’s father was keen that his son would become a businessman. That was the plan. It didn’t quite work out that way. At high school, Erol Büyükburç joined his first band and became the lead singer. This gave him first tantalising taste of what life in a band was like. In 1954, eighteen year Erol Büyükburç took to the stage with Ismet Sirel’s Orchestra for the first time. Already, Erol Büyükburç had a powerful, emotive voice. This he put to good use over the next few years. Despite his interest in music, Erol Büyükburç enrolled at Istanbul University to study economics. He had struck a deal with his mother that he could practise his singing in the basement until his father returned home. When he returned home, Erol Büyükburç had stop his practise and concentrate on his studies. Eventually, it became apparent that Erol Büyükburç wasn’t going to complete his degree. So he left University and began his military service. This was compulsory for all young Turkish men. Erol Büyükburç was sent to Urfa, which was around three hours east of Adana. However, much of Erol Büyükburç’s two years military service was spent singing in the officer’s club. That was where Erol Büyükburç first met movie star Leyla Sevar. After their initial meeting at the officer’s club, the pair soon became friends. Leyla Sevar realised that Erol Büyükburç had potential as a singer. She was willing to used her many contacts within the Turkish music industry to help him secure a recording contract. Soon, Leyla Sevar had secured Erol Büyükburç a recording contract. The next weekend he headed home to Istanbul, he recorded Little Darling and One Way Ticket at the city’s Odeon Studio. This was the first of many singles Erol Büyükburç would record during his long and successful career. Success didn’t arrive overnight for Erol Büyükburç. Instead, he had to wait several years before enjoying a hit single. This allowed him to hone his skills as a singer and songwriter. By 1961, Erol Büyükburç was writing his own songs, which he sung in English. One of Erol Büyükburç’s compositions was Little Lucy, which he released as a single in 1961. It gave Erol Büyükburç his breakthrough single, and transformed his fortunes in the process. Over the next four years, Erol Büyükburç star was regarded as one of the rising stars of Turkish music. This changed in 1965, when he entered the prestigious Altin Mikrofon competition. Entrants were encouraged to combine Turkish lyrics with Western instrumentation. That year, the competition was fierce, with Silüetler one of the favourites for the first prize. However, it was Erol Büyükburç that won the Altin Mikrofon competition. This was a game-changer for him. Just like all artists who won the Altin Mikrofon competition, Erol Büyükburç was awarded a recording contract and embarked upon extensive tours. Soon, Erol Büyükburç embarked upon one of the most productive periods of his career. He released single after single, as 45s and 78s. This included singles like Kiss Me, Lovers Wish and Memories. Other singles included covers of songs made famous by Elvis Presley and The Kingston Trio. After 1965, most of the singles Erol Büyükburç released from 1965 onwards were sung in Turkish, as Anatolian pop and rock was booming. The only single he released with English lyrics was in 1969. By then, Erol Büyükburç had diversified. The first Turkish national orchestra was founded in 1964, and a competition called the Balkan Music Festival was held to choose the lead singer. Several singers had enjoyed their time as lead singer of the Turkish national orchestra. However, when Erol Büyükburç entered he won the competition three years in a row. Soon, he had settled into his new role and enjoyed fronting the Turkish national orchestra. Having won the Altin Mikrofon competition and having fronted the Turkish national orchestra for three years, Erol Büyükburç’s had never been higher. He was one of the biggest names in Turkish music. It was no surprise that film directors wanted Erol Büyükburç to star in their movies. Erol Büyükburç agreed and eventually, would feature in thirty-three films during his career. Despite his nascent acting career, music was still Erol Büyükburç’s priority. It had been his career for over a decade. That would still be the case as he signed to the French label Pathé in the late sixties. That was no surprise to anyone familiar with Turkish music. Erol Büyükburç was still a hugely popular artist in Turkey. He was colourful, flamboyant and a showman. Sometimes when Erol Büyükburç took to the stage, he sported the latest fashions. Other times, his stage costumes were outlandish, and very different to what most musicians were wearing in the late sixties. It was no surprise that Pathé decided to sign Erol Büyükbur. He released two albums for Pathé during 1968. The first album Erol Büyükbur released was Kırık Kalp, which featured singles Erol Büyükburç had released over the last few years. So did Yasemin, which was released later in 1968. However, both albums sold well and the Erol Büyükburç success story continued. Towards the end of the sixtes, Erol Büyükburç switched labels again. This time, he signed to Saner Plaklari and released much more experimental, harder sounding music. Given how different the music was to his previous singles, Erol Büyükburç risked alienating his existing fans. Still, these singles gave Erol Büyükburç several minor hit singles. Alas, they didn’t enjoy the same success as other Anatolian rockers liken Barış Manço and Cem Karaca. Their music was regarded as much more political, and dealt with social issues that affected the people of Turkey. This was very different to the singles Erol Büyükburç had released. However, in 1972, his career headed in a very different direction. For the majority of his career, Erol Büyükburç had been accompanied by an orchestra on his singles. This sound had fallen out of favour as Anatolian rock grew in popularity. So in 1972, Erol Büyükburç’ joined forces with the rock band Elçiler. Over the next few years, Erol Büyükburç and Elçiler released a series of singles and EP’s. This included some of the tough, hard rocking music as Erol Büyükburç sought to reinvent himself and his music. The sound had the potential to introduce Erol Büyükburç to a much wider audience. Anatolian rock was hugely popular by 1972. During the years Erol Büyükburç and Elçiler worked together, Anatolian rock grew in popularity. However, the partnership between Erol Büyükburç and Elçiler never quite reached the heights it should’ve. What didn’t help was the constant changes in Elçiler’s lineup. When Erol Büyükburç switched labels, and moved from Saner Plaklari to Diskotür this spelt the end of the partnership. The move to Diskotür coincided with Erol Büyükburç returning to much softer arrangements. Not long after this, Erol Büyükburç collaborated briefly with Turkish lyricist Çiğdem Talu. Erol Büyükburç even recorded some children’s songs and at one point, recorded some heavier sounding songs. Then in 1976, Erol Büyükburç began work on his third album Hop Dedik. Although Hop Dedik would be Erol Büyükburç’s third album, his two previous albums featured singles that he had released. Never before had recorded an album from scratch. This was a new experience for him. For Hop Dedik Erol Büyükburç put his songwriting skills to good use. He cowrote nine of the twelve tracks, including Oldu Olacak, Dandini, Bile Bile Lades, Sen Mi O Mu, Öyle Mi Böyle Mi, Şaka Maka Derken, Hop Dedik, Civciv Çıkacak Kuş Çıkacak and Sevgiye Tutsak. The other three songs, Güz Şarkısı, Hep Sen Varsın and Dedim Dedi were cover versions. These songs were recorded with Erol Büyükburç’s backing band Efsaneler. They had been formed in 1973, but Efsaneler’s lineup changed several times over the next three years. It wasn’t until December 1975 that Erol Büyükburç and Efsaneler released their debut single Allah’im Beni De Gor. Tucked away on the B-Side was Civciv Çıkacak Kuş Çıkacak. It would feature on Hop Dedik. 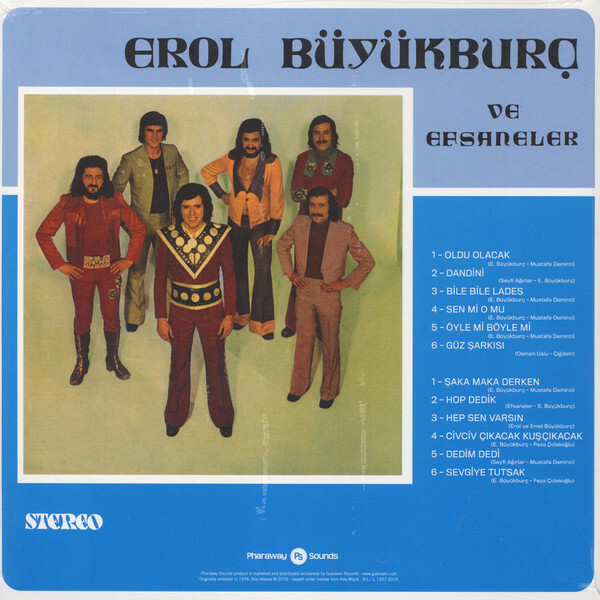 The rest of Hop Dedik was recorded in early 1976 by Erol Büyükburç and Efsaneler. They recorded music that had a much more contemporary sound. It had been influenced by everything from disco, funk, rock and soul. Still, there was an Anatolian influence throughout Hop Dedik, which was released in late 1976. When Hop Dedik was released Erol Büyükburç it was to critical acclaim. Erol Büyükburç had reinvented himself and music on his third album Hop Dedik. It was well worth the eight year wait. Oldu Olacak (Will Be) opens Hop Dedik, and straight away there’s traditional sound, as a mandolin joins with the rhythm section. Only the rhythm section remain when Erol’s heartfelt vocal enters and he delivers the lyrics to this rueful ballad. Meanwhile, the rhythm section lock into a tight groove. Sometimes, the bass is almost funky as the arrangement becomes jaunty. Later Efsaneler contribute harmonies and the mandolin returns. They accompany Erol as seamlessly they combine traditional Turkish and Western music on this beautiful, ballad. A chirping guitar is panned left and almost dances across the arrangement to Dandini. It features drums, percussion and a second guitar. They accompany Erol as he delivers a powerful, emotive vocal. When it drops out, a funky guitar takes centre-stage. Soon, the vocal returns and grows in power. Still the guitars and percussion play an important part as the song reaches a melodic and memorable crescendo. As Bile Bile Lades unfolds traditional Turkish and Western music melt into one. The arrangement is choppy, as a bağlama join with the rhythm section. They usher in Erol’s vocal, which quickly grows in power. Soon, the tempo increases slightly and the arrangement flows. Meanwhile, urgent soulful harmonies accompany Erol’s impassioned vocal while the rhythm section provide the heartbeat. All too soon, this quite beautiful, melodic song is over, leaving just the memory of what’s gone before. There’s a tougher, almost psychedelic sound to Sen mi O mu. A searing guitar cuts through the arrangement, that comes courtesy of the rhythm section and guitar. Soon, Erol’s vocal enters, and he delivers the lyrics quickly. Meanwhile, an effects laden guitar responds to his call, while drums rumble. Later, a blistering guitar cuts through the arrangement as Erol and Efsaneler combine psychedelia, Anatolian rock and pop to create a truly irresistible song. A bubbling bass, percussion, chirping guitar combine on Öyle mi Böyle (Is It So?. They’re joined by urgent harmonies as the arrangement heads in the direction of funk. When Erol’s vocal enters it’s soulful and stylistically is reminiscent of legendary Brazilian singer Tim Maia. Meanwhile, the tempo is slow, and the music funky. Hooks haven’t been spared on this slow, soulful and funky track that features Erol Büyükburç at his best. There’s a much more understated and wistful sound to Güz Şarkısı (Autumn Song) as an acoustic guitar and percussion combine. Soon, the rhythm section join but take care not to overpower Erol’s soul-baring vocal. It grows in power and at one point, there’s an almost psychedelic sound. This comes as a myriad of percussion joins the acoustic guitar and rhythm section. Later harmonies provide the perfect accompaniment to Erol on as he lays bare his soul on this wistful ballad. Straight away, a funky guitar takes centre-stage as fingers fly up and down the freeboard, as it’s joined by the rhythm section and percussion on Şaka Maka Derken. Soon, soulful harmonies accompany Erol, and respond to his call. Behind him, the rhythm section and guitars have locked into a funky groove. Meanwhile, the harmonies have a gospel sound, and sometimes, are reminiscent of Brothers and Sisters. There’s even a nod to Sly and The Family Stone, on this soulful, funky opus as Erol continues to reinvent his music. A guitar rings out on Hop Dedik before wah-wahing. It’s joined by the rhythm section who power the arrangement along. By then, it sounds as if British groups from the late-sixties have influenced Efsaneler. They enjoy the opportunity to showcase their considerable skills. This continues when Erol’s choppy, vampish vocal enters. Meanwhile, a strummed acoustic guitar, bubbling bass and funky guitar accompany Erol. When his vocal drops out, Efsaneler take centre-stage, combining elements of rock, funk and psychedelia. When Erol’s vocal returns, it’s soulful, emotive and vampish as he breathes life into the lyrics on this genre-melting track. There’s an urgency to Hep Sen Varsın as the rhythm combine rock and funky. Guitars wah-wah as Erol unleashes a vocal powerhouse and is accompanied by punchy harmonies. When the vocal drops out, handclaps accompany the rhythm section as they drive the arrangement along and guitars ring out. Later, when the vocal returns, it’s soulful and swings before becoming urgent. So too does the arrangement, while the guitars add to the funk factor before this irresistible song reaches a crescendo. The rhythm section lock into a groove with a wah-wah guitar on Civciv Çıkacak Kuş Çıkacak. They power the arrangement along, before an accordion and percussion join. Soon though, the accordion drops out, and Erol’s delivering a breathy vampish vocal. As it soon grows in power, Erol scats emotively. Meanwhile, percussion, wah-wah guitar and accordion combine to create a backdrop for Erol Later, when the accordion drops out, the wah-wah guitar accompany Erol whose vocal veers between breathy and tender to powerful and impassioned. It’s one of his finest vocals on Hop Dedik. There’s a heavy, lysergic sound to Dedim Dedi (I Said I Said) as guitars wah-wah, cymbals rinse and the bass adds an element of darkness. Soon, percussion accompanies Erol, whose vocal is rueful and full of sadness. Slowly and deliberately he delivers the lyrics while the bass bubbles, the guitars shimmers and later, harmonies accompany him. They seem to sympathise with him, before his vocal becomes a rueful soliloquy on this poignant song. Closing Hop Dedik is Sevgiye Tutsak which has a cinematic sound. That’s no surprise, as three songs on the album, Oldu Olacak, Sen mi O mu, Şaka Maka Derken featured on films that Erol starred in. Despite its cinematic sound, Sevgiye Tutsak never made it onto the silver screen. That is a great shame, as it’s one of the highlights of the album. It features a heartfelt vocal from Erol, while an organ, guitar and the rhythm section accompany him. They take care not to overpower his emotive, impassioned vocal on this beautiful cinematic ballad. Eight years after Erol Büyükbur released his sophomore album, he returned with Hop Dedik in October 1976. It was very different from the two previous album Erol Büyükbur had released. They were essentially greatest hits albums. By 1976, record buyers wanted something more. What they wanted was an album of new material from Erol Büyükbur. So he went away and cowrote six new songs. The other three, that he cowrote, had already featured on films that Erol Büyükbur had starred in. These new songs and three cover versions were recorded with his talented backing band Efsaneler. The result was Hop Dedik, which was released in October 1976. When Hop Dedik was released, it was to critical acclaim. Sadly, the album didn’t sell in vast quantities. Since then, Hop Dedik has become a cult album and has grown in popularity. However, the few original copies Hop Dedik that come up for sale change hands for over £300. That is beyond most record buyers. Fortunately, Pharaway Sounds, an imprint of Guerssen Records has recently released Erol Büyükbur’s third album Hop Dedik. It found Erol Büyükbur reinventing his music. The result is Hop Dedik, a truly enclitic album, where Erol Büyükbur combines elements of several disparate genres. This includes traditional Turkish music, disco, funk, pop, psychedelia, rock and soul. There’s also Anatolian pop and rock influences throughout Hop Dedik where the music of two continents melt into one. Hop Dedik was without doubt, the best album of Erol Büyükbur’s career. He reinvented himself and his music on Hop Dedik, which was a genre-melting album. No two tracks are the same as Erol Büyükbur switches seamlessly between heart-wrenching ballads, funk, rock, soul and psychedelia. This showed that Erol Büyükbur was a truly and talented and versatile singer. Proof, if any is needed, is Hop Dedik, a career-defining album that features flamboyant showman Erol Büyükbur at the peak of his powers.